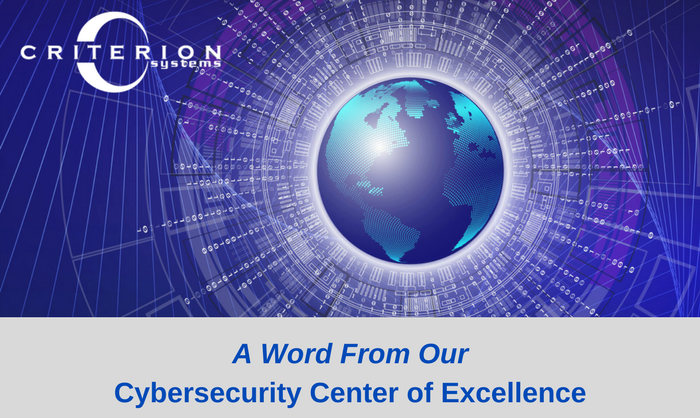 I’d like to share with you a recent conversation I had with Linda Montgomery, president of The Learning Center-Las Vegas about its new Cybersecurity Apprenticeship Program. Criterion is a corporate sponsor for the apprenticeship initiative. Brian: How did The Learning Center-Las Vegas get involved with the Cybersecurity Apprentice Program? Linda: Since I was Chair of the IT Sector Council when it was formed in 2012 and my background is in IT and cyber workforce development and the skills shortage in Nevada, I was asked to accept an appointment to join the Nevada State Apprenticeship Council. It was an easy decision for me to make to join the team and it has been a great ride since. What are your goals for the program for this year? For coming years? The goals for 2019 are to build community engagement in the program through an outreach program, grow the sponsorship base, and to identify the career paths that meet the needs of the sponsors. For 2020 and beyond, the aim is to take the program to the rest of the nation, a very ambitious plan but with the help of corporate sponsors like Criterion, we are up for the challenge! Why do you think such a program will be effective? With the strain in the IT and cyber workforce from a local, national, and global perspective, we decided to take a look at the apprenticeship model for workforce development. When most folks think of apprenticeships, they tend to think of it as a tool used in the various trade industries (plumbers, electricians, carpenters, etc.). However, this human-focused model applies just as well to IT and cyber. We believe this model will provide substantial return to both the sponsors and the employees that take part in the program. The program is based on the NIST NICE initiative and focuses on identifying the skills required (or that will be required) and then folds that skills training into the program. Why is the Las Vegas region so promising for cybersecurity jobs? Governor Sandoval has positioned Nevada to be in the driver’s seat by identifying nine emerging technology job sets and outlining plans to help train the Nevada workforce to take advantage of the vast number of jobs available in up-and-coming sectors such as IT and cyber. Nevada is and will continue to be a leader in identifying and training its workforce, thus attracting companies seeking to take advantage of a well-trained and relevant population of potential job seekers. We already have industry leaders like Apple and Google in Nevada and through these types of programs are attracting more companies. What are some other ways the Learning Center supports workforce development in the region? We support the workforce development through The Learning Center and Cyber World Institute with initiatives like Capture the Flag exercises, training webinars, and various STEM initiatives. We are also very active in the community and have a focus on bringing veterans and underrepresented individuals into our programs. What would you like to say to Criterion’s audience about its support of the program? I would like to convey a deep appreciation to Criterion and its management team. Lots of companies talk the talk but Criterion is walking the walk with their outstanding support of the program. We consider Criterion to be a trailblazer in this initiative and will use them as an example to other companies that are considering joining the program. Thanks for your support!